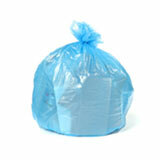 High density bags are made of HDPE aka High Density Polyethylene. 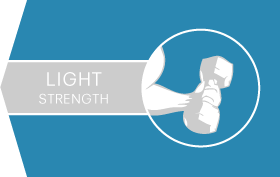 This strong but lightweight film is very economical to produce and to ship. 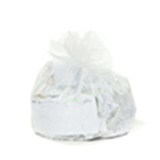 At just 6 microns thick, these garbage bags are the lightest we sell, and are popular used as small wastepaper basket liners in bathrooms and offices. They are perfect for waste like tissues, office paper, and other lightweight trash. 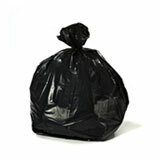 This category contains mainly small garbage bags between 3 and 10 gallon capacity. Bottom Line Peace Of Mind. 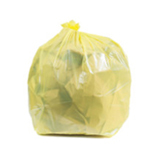 Small trash bags and waste basket liners are a much more attractive and professional alternative to old grocery bags and oversized trash bags that leave lots of excess plastic bunched around the rim of the can. 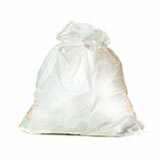 We offer neat clear trash bags which are the right size for your can make an amazing difference. 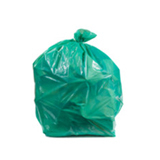 These 6 micron garbage bags are exceptionally affordable, making it easy to upgrade to a well-sized bag. Buying bulk high density can liners makes it even more economical. 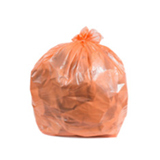 Wholesale garbage bags from Plastic Place just make sense. You’re paying so much less per bag, you rarely have to restock, and the bags arrive right at your door, ready to work. 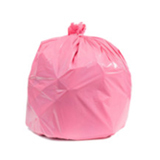 Providing an exceptional customer experience is very important to us, so we have a staff full of carefully trained experts who know garbage bags inside and out. 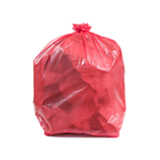 We love answering questions, and we are dedicated to making sure you always get the right trash bags for your needs. It doesn’t matter if you’re buying one roll of waste basket liners for your home bathroom or 100 cases of garbage bags for a busy business, you’ll get our complete attention and our 100% satisfaction guarantee every time. So go ahead and order with confidence. 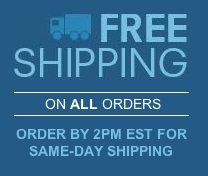 We’ll send your bulk trash bags out the same day.